Gene Clark, born Harold Eugene Clark was an American singer-songwriter, and one of the founding members of the folk-rock group The Byrds. As a singer and songwriter, Gene Clark was one of folk rock's most important innovators during the mid-1960s. He and Jim (later Roger) McGuinn founded the Byrds in 1964, and Clark was the group's primary songwriter for their first two albums. Although less commercially successful outside the Byrds, his work with Doug Dillard in the late 1960s and solo work in the early 1970s played a central role in the development of country rock. These successes, however, were sometimes countermanded by Clark's personal demons. His fear of flying prevented him from touring on a regular basis, and years of substance abuse would eventually destroy his health. He nonetheless left a daunting legacy that influenced alternative country artists during the 1990s and beyond. His father played guitar and listened to country music, and at the age of nine Clark received his first guitar. At first he listened to Hank Williams and attempted to write his own songs, but as a teenager he listened to Elvis Presley and the Everly Brothers. At age 13 he joined several other students to form Joe Meyers and the Sharks, and the group recorded one of Clark's early songs, "Blue Ribbon," on a small label. By the late 1950s, however, Clark---like many others---was caught up in the urban folk revival, and began listening to groups like the Kingston Trio. Soon he and two friends formed their own folk group, the Surf Riders, and performed regularly in Kansas City. Clark's first real break came in June of 1963 when Randy Sparks of the New Christy Minstrels saw the Surf Riders perform at the Castaways. Sparks offered Clark a position in the popular folk group, and the 18-year-old accepted. His tenure in the group, however, would be a brief and unhappy one. Unwilling to assert himself forcefully, he was relegated to the role of backup singer with no lead vocals. Clark also disliked the group's pop approach to folk music, and after seven months of touring, he left the group. Before leaving the Christys, however, he experienced a sea change in his musical orientation when he heard the Beatles' "She Loves You" and "I Want to Hold Your Hand." In a biographical essay on Clark printed on the Byrd Watcher website, Clark was quoted as saying, "I knew, I knew, that this was the future, this was where music was going and ... I wanted to be a part of it." Clark relocated to Los Angeles in early 1964, where he met Jim McGuinn on a street corner singing the Beatles' "You Can't Do That." Soon the two like-minded ex-folkies formed the Byrds with David Crosby, Michael Clarke, and Chris Hillman. Clark's lead vocals, ability to harmonize with McGuinn, and keen songwriting skills contributed to the high artistic quality of the group's first two albums, but his residence in the Byrds was troubled. He disliked life on the road, and had developed a fear of flying while working with the Christys. Tensions also developed within the band. Clark, as the band's major writer, generated more income from royalties than other members, leading to discord. In March of 1966, by mutual consent, Clark departed from the band. Clark quickly signed a solo contract with Columbia and started recording an album with the aid of the Godsin Brothers. Alex Stimmel of All Music Guide called Gene Clark With the Godsin Brothers "one of the best, if not the best" of Clark's records, but the album sold poorly. Many would later point to the fact that Gene Clark With the Godsin Brothers was released within a few days of the Byrds' Younger Than Yesterday, and that Columbia had concentrated its marketing efforts on the already successful Byrds. But Clark soldiered on, forming a second band with guitarist Clarence White, bassist John York, and drummer Eddie Hoh. This group, too, was short-lived because of Clark's fear of flying. With his career stalled, he began to rethink his departure from the Byrds, and by October of 1967 he had rejoined the fold. Old conflicts emerged, though, and by November Clark had left the band again. After taking some time off from music, Clark regrouped in 1968, joining with banjoist Doug Dillard and multi-instrumentalist Bernie Leadon at A&M Records. Their first album, The Fantastic Expedition of Dillard and Clark, was a pioneering country-rock record filled with first-rate songwriting. As would be the case throughout Clark's solo career, however, the album found no more than a cult following and sold very few copies. After a second album with Dillard, Clark returned to solo work, embarking on the most fruitful period of his career. Released in 1971 on A&M, White Light found Clark hitting his stride as a songwriter. "Over its nine original tracks," wrote Thom Jurek in All Music Guide, "it has established itself as one of the greatest singer/songwriter albums ever made." Clark followed in 1972 with Roadmaster, an album that cohered well despite being cobbled together from disparate sessions, and then issued No Other in 1974, a heavily produced album that many Clark fans have labeled as their favorite. Throughout his career Clark would sporadically participate in reunions with the Byrds. In 1973, before the recording of No Other, Clark joined with his ex-bandmates for the ill-fated Byrds, an album panned by critics. In 1977 Clark and McGuinn toured with acoustic instruments and were occasionally augmented by Chris Hillman and David Crosby. McGuinn, Clark, & Hillman appeared on Capitol in 1979, and although the album reached number 39 on the American album charts, the critics disliked its contemporary sound. Clark pursued a number of musical projects over the next 12 years but recorded infrequently. His career, nonetheless, had begun to bear fruit, as many young musicians began to acknowledge Clark's influence as a country-rock pacesetter and first-rate songwriter. In 1988 Clark underwent surgery for an ulcer, and half of his stomach and part of his intestines were removed. In 1989-90 he became involved in a legal battle over the use of the Byrds' name, but nonetheless took part in a full reunion with the band when it was inducted into the Rock and Roll Hall of Fame in January of 1991. Three months later, on May 24, 1991, Clark was found dead of natural causes at his home in Los Angeles. 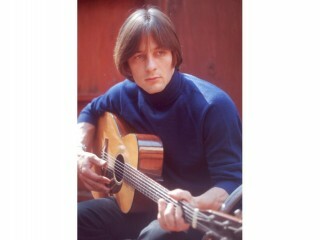 View the full website biography of Gene Clark.